In less than two weeks, we'll be at the Walter Kerr for the first preview of the first Broadway revival of A Little Night Music. It's too long in coming, but perhaps just in time. This week, my dear friend Kari at Lit-Wit offered a heartfelt paean explaining why she loves Send in the Clowns, the crowning glory of A Little Night Music. Earlier this year on NPR's Performance Today, host Fred Child spoke with Rob Kapilow about the musical complexity of Sondheim's masterpiece in Stephen Sondheim's Clever 'Clowns'. The story includes a clip of Millicent Martin's rendition of the piece. Great song composers, whether it's Schubert or Sondheim, do not really set words to music. What they set is the emotion that's behind the words. 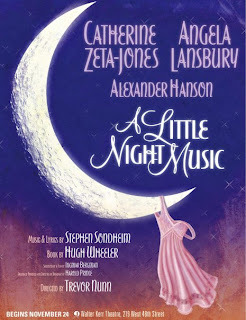 Some time since when I was desirous to hear the great musicals composed and oftentimes written by Sondheim, I listened to the Original Broadway Cast Recording of "A Little Night Music." I had heard the song "Send In The Clowns" before this, courtesy of a "Live From Lincoln Center" broadcast, and I anxiously waited for that song to reveal itself, but when I heard Glynis Johns sing it, I thought it was terrible; indeed, it had not sounded like that when I had first heard it. The song sounded scratchy as if it were more spoken than sung. Do you have the same sentiment, or do you see a greater artistry at work here that I cannot? Also, how do you think this production will turn out? Will it be a worthy following to the original? Obviously, I do not expect you to answer necessarily yes or no, but I am merely wondering if the expectations we all have are merited. Tyler, You're missing the point of Sondheim. He writes for actors who sing. It is not terrible. In fact, Glynnis' performance is legendary and brilliant. It is not meant to be sung - it is acted. Every word and note is dripping with the pain that Desiree feels. Also check out renditions by Judi Dench, Millicent Martin, Angela Lansbury, and Betty Buckley. I know there are 100s of others, but when the phrases are held too long, it's pretty but the point is missed. I have high hopes for this revival and believe it will be wonderful. What a wonderful find this is! Thank you thank you thank you!